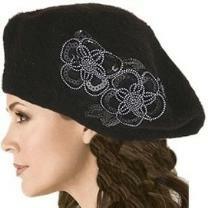 Is there a need to have a specific page for ladies' berets? 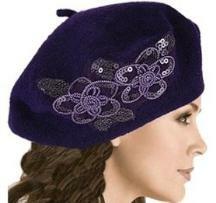 Not really, all berets are easily worn by both sexes, but there are a few that are typically designed and made for women. 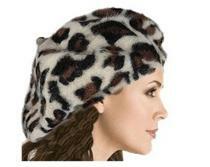 In the Spanish section there are the boinas Femina by Boinas Elosegui; there are the large cotton berets under the South Pacific Berets label and there are berets with cheetah print and flower design. Imported from the USA. 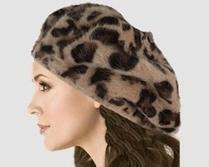 These Basque Berets with leopard print are approximately 285mm in diameter in a one-size-fit-all. Material: 80% Angora, 20% acrylic. 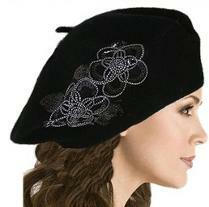 These Basque Berets with flower design are approximately 285mm in diameter in a one-size-fit-all. Material: 80% wool, 20% acrylic.